For the ultimate all-around race performance, the Women’s SuperSix EVO strikes the perfect balance. Its unrivaled blend of light weight, stiffness, aerodynamics and smooth-riding compliance gives you the winning edge on every part of the race course. The EVO is the best all around women’s road racing bike ever made, thanks to its perfect balance of everything it takes to go fast. BallisTec Carbon Construction and System Integrated design make EVO crazy light, but durable enough for our Lifetime Warranty. EVO is offered in both BallisTec Hi-MOD and BallisTec Carbon versions, for rim and disc brakes. Serious road racers and women who want ultimate race performance. A flat back for flat out speed. Cannondale’s Road Race geometry delivers a responsive and nimble ride in all handlebar positions to perfectly set you up for the win. Frame: SuperSix EVO Disc Women's, BallisTec Carbon, Di2 Compatible, SPEED SAVE, PressFit BB30. Fork: SuperSix EVO Disc, SPEED SAVE, BallisTec full Carbon, 1-1/8" to 1-1/4" steerer, integrated crown race, 100x12mm thru-axle. Tires: Schwalbe Lugano K-Guard, Folding, 700x25c. Crank: Cannondale Si, BB30a, FSA rings, 50/34. 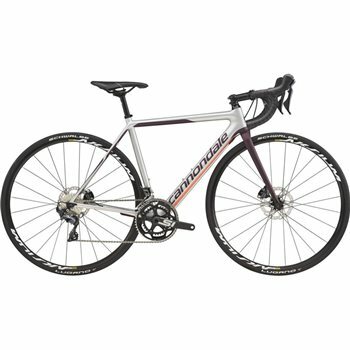 Cassette:Shimano Ultegra R8000, 11-28, 11-speed. Rear Derailleur: Shimano Ultegra R8000 GS. Handlebar: Cannondale C2 Women’s Compact Wing, butted 2014 Alloy. Grips: Cannondale Bar Tape, 3.5mm. Stem: Cannondale C2 7050 Alloy, 31.8, 6 deg. Headset: SuperSix EVO, 1-1/4" lower bearing, 25mm carbon top cap. Brakes: Shimano Ultegra R8020 hydro disc, flat mount, 160/160mm. Saddle: Selle Royal Seta S1 Women's. Seatpost: Cannondale C2 Carbon, 25.4x350mm.